Malls reluctant to carry your product? Try selling online, like this baby products merchant. It is often said that in business, populating the right ‘niche’ is a potent recipe for success. Businesses which are targeted at underserved markets can count on steady sales sans the fierce competition that often comes with serving the bigger segments. And with the Internet opening new avenues for growth, entrepreneurs are finding it increasingly profitable to take their products online and ditch traditional storefronts altogether. For online retailer like Proud Mama Concepts, zeroing in and fine tuning their businesses to cater to a huge and otherwise untapped market did the trick. Creating customized baby apparel, these two online merchants have proven that a great business concept with a defined target market can be successful in any environment. Bosom buddies and full time moms Rianna Roces-Trinidad and Sheryll Ang-Tiong bemoaned the limited choices for baby clothing in local store shelves. After bandying the idea about some more, the pair decided to create their own line of children’s wear, and called it the Proud Mama Store. Now, what started out as a brainstorming session has turned into a fledgling online store that carries four signature lines: Proud Mama Nursing Cover, a fashionable nursing bib for mothers; Tee Hee, a line of unique shirts for kids; Funkytubes, a line of functional children’s play sleeves; and their popular Funkyfeet cotton baby socks. They sell these online through their Multiply.com site and through consignment in major retail outlets. Their prices range from P320 to P500 for the socks and P450 for the shirts. Proud Mama initially wanted to set up physical retail stores inside popular shopping malls, but their plan went for naught when their concept was rejected by mall operators. But this setback forced them to take the online route, a move that has been paying dividends for the company. Having unique business concepts helped the brand thrive online, where customers are looking for one-of-a-kind items and are willing to pay a little more just to get them. Proud Mama Concepts’ Funkyfeet baby socks is a great example of a unique idea that people are willing to pay extra for. “We found out that making babies wear shoes when they are young is actually not a good thing, because they will have a hard time finding their balance. That is why we settled on designing baby socks with cute designs which mothers and their babies would appreciate. 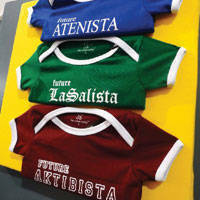 And since they’re soft, babies would love to wear them,” Ang-Tiong said. Roces Trinidad, a marketing professional by trade, recognizes the contribution their online store has made to their brand building efforts. She says real-time communication is something that sets online retailers apart from traditional ones. “Back in the day, you had to wait for a certain period of time to determine how effective your campaign was. Now, you get instant feedback because of the Internet. It is very helpful for startups because they have limited budgets, and have little wiggle room to be coming out with non-selling items,” she said.